This premier waterfront home is without a doubt one of Keowee Keyâs most breathtaking homes. Exceptional water views may be seen throughout most every room in the house. A beautiful stone entry blends perfectly with the natural lush surrounding. The interior light-filled spaces create a relaxed and sophisticated feel for today's luxury lifestyle. Upon entrance, the foyer leads to the fireside living room and elegant dining room. Hardwood floors are highlighted throughout most of the main level. The chef's appointed kitchen is perfect for entertaining a crowd with handsome custom cabinetry, a commanding center Granite island, a lovely pantry accented by a glass door, prep sink, top- of- the- line appliances, Sub-Zero refrigerator, wine cooler, warming drawer and so much more. There is a spacious breakfast room that flows into the adjoining sunroom which is sure to be a gathering spot among family and friends. The main level luxurious master suite has a spa-bath with a large walk-in shower, jetted tub, dual vanities and two walk-in closets. Entertaining on the lower level is easy with a fireside recreation room, cork flooring and lots of windows with views of the emerald waters of Lake Keowee. Three private guest bedrooms, two full baths, abundant storage areas, and a sitting room/study complete the lower level. Upper and lower composite Trex decks are also featured on this one of a kind property. The grounds facing the lake feature an oasis landscape that was meticulously designed by Tony Francisco of Unlimited Landscapes. A cascading waterfall adjacent to the spacious flagstone designer patio creates a gorgeous setting for outdoor living. Additionally, the property has a wonderful beach area for swimming or relaxing by the lake. Take a gentle walk to the full-size covered dock. This property is the ultimate setting for enjoying a vacation lifestyle everyday and watching the spectacular sunrise and sunsets over the water. 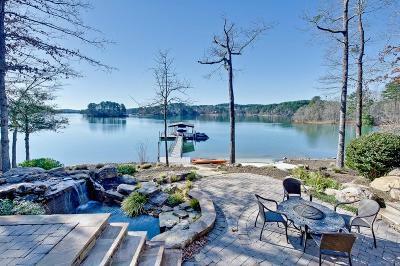 Truly a dream home on Lake Keowee!